I met my husband in scuba class. We love the beauty and surprise that we can find beneath the surface of our oceans. But for more than six decades, plastic waste has been threatening that beauty, accumulating in and polluting oceans worldwide. Extrapolating, by 2050 there may be more plastic in our oceans than fish. How can we prevent something that is so ubiquitous from ruining our environment? To David Katz and Shaun Frankson, co-founders of Plastic Bank, the solution is deceptively simple: Pay people to keep it on dry land. They think their company has hit on a fix, which starts by keeping plastic from getting into the ocean in the first place. Plastic Bank is a for-profit business with the goal of turning plastic from environmentally dangerous garbage into something of value. “If you were walking down the road and every bottle on the side of the road was worth $5, how many would be left? None,” Katz says. And that is how Plastic Bank works: In developing countries such as Haiti and the Philippines, the group works with regional businesses to turn plastic that litters not just oceans, but rivers, beaches, parks, and streets, into a new kind of currency. Plastic Bank sets an artificially high rate for redeemed bottles and other plastic waste, incentivizing collectors to gather the trash and bring it in for recycling. Collectors receive payment, and Plastic Bank recycles the material into “social plastic,” which it then resells at a premium to environmentally aware-partner businesses like Henkel and Norton Point Sunglasses, which in turn craft it into recycled consumer goods, each branded with the social plastic message. Norton Point’s pledge is to remove one pound of plastic from the ocean for each pair of sunglasses it sells. 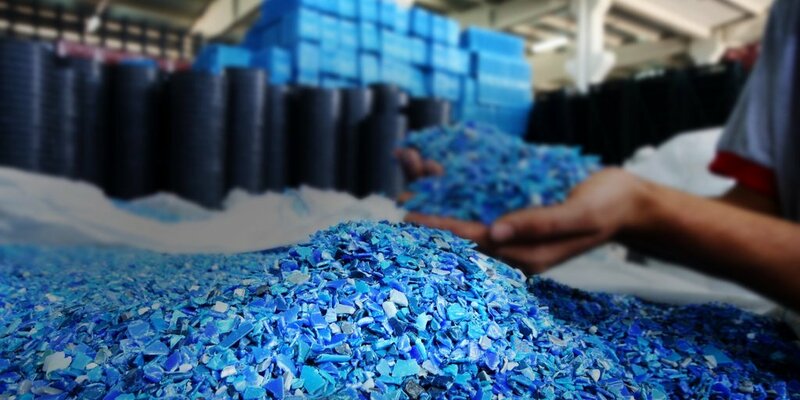 Henkel has committed to buying 220 million pounds of social plastic annually, according to Katz. One of the challenges of rewarding waste collection is the potential for fraud and theft. There’s no incentive for collectors to spend all day gathering bottles if their cash payments will be stolen that night, and there’s no incentive for sponsor companies to pay extra for recycled plastic if those funds end up lining the pockets of organized criminals. Plastic Bank’s solution to those issues? Blockchain. Instead of cash, collectors receive a blockchain-based digital token on their smartphone that can be exchanged for actual goods with merchants who use Plastic Bank’s infrastructure. Users can shop for groceries, pay for school tuition, acquire medical insurance, or even buy basic utilities via microtransactions — paying a few cents for the use of a solar lantern for an evening. Most importantly, funds can’t be stolen, and manufacturing partners can fully verify that their contributions are being used as intended. Built on LinuxONE, Plastic Bank’s system ensures the companies funding the program that the money goes where they expect. Because the system is built using blockchain technology based on The Linux Foundation’s Hyperledger Fabric framework, records are immutable, meaning they cannot be altered or manipulated without the consensus of the network. IBM Blockchain technology is a key part of the solution, and it’s been working so well that Plastic Bank may soon expand its solution beyond the current design. While today a Plastic Bank token is only exchanged once after a collector receives it, the system may ultimately allow for repeated use. For example, a collector could spend a token on a taxi, who could then spend that token to buy a pair of shoes. According to Katz, the system works wonders not just for the environment but also for the lives of the residents of these communities. “There’s nothing worse than having a few pennies and having to hide it in a shack where you don’t even have a door,” says Katz. “With Plastic Bank, you get a savings account, and can even earn a credit rating based on the consistency of your interaction with us.” Since there’s no physical money to worry about, users access their account via a smartphone. If they don’t own their own phone, they typically borrow one from a local merchant.